Child & Family Service | CFS President & CEO Karen Tan on Hawaii News Now Sunrise! CFS President & CEO Karen Tan on Hawaii News Now Sunrise! CFS President & CEO Karen Tan was featured on Hawaii News Now Sunrise on 7/18/2018! Karen was showcasing our CFS Community Crisis Resource and Relief Guide, which is being handed out at various locations throughout the Hilo area, and our CFS Ohana Kits, which will be distributed to families affected by the eruptions. 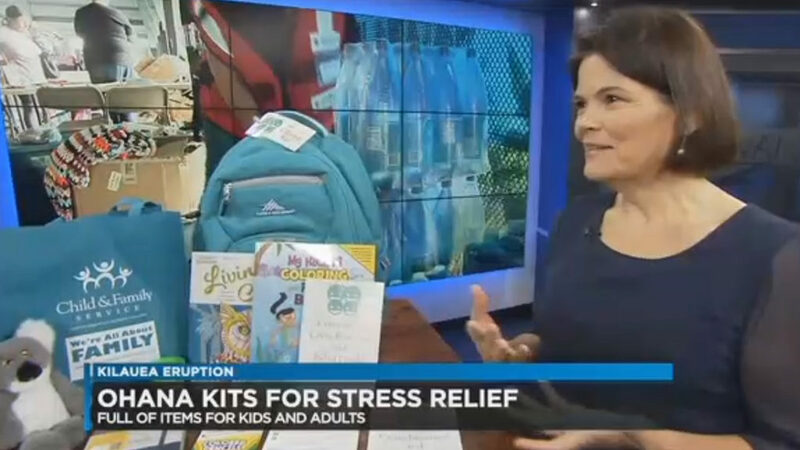 Ohana Kits – American Savings Bank, CFS Guild, First Hawaiian Bank, Kona Brewing Co., Pettus Foundation, St. Anthony School, The Make Sense Foundation, & Community Donations.